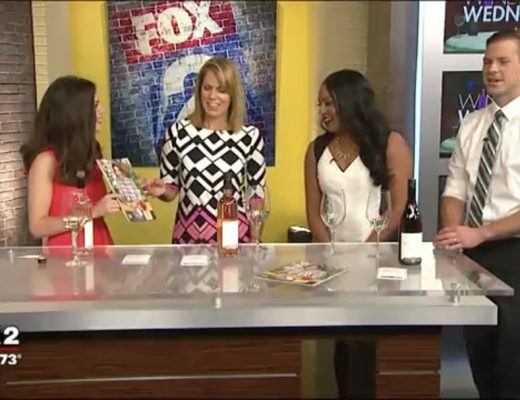 Liz Mally, owner of the Metro Detroit pop-up flower bar LPF, shares easy flower arranging tips to decorate your home or create your own bouquet. 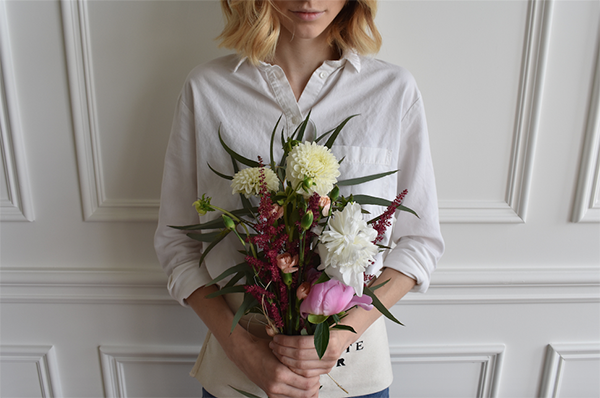 There’s something about fresh flowers that brings an inherent joy to our everyday lives. Whether they’re sitting pretty in a vase on your kitchen counter or growing wild in your yard, flowers all speak the same language and know just what to say — in times of happiness, sadness and excitement. It’s this exact feeling that led me to create LPF, short for la petite fleur — “the little flower” in French. 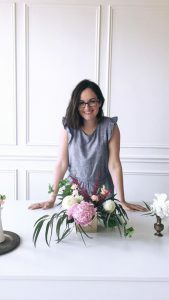 Together with my sister, we design florals for weddings and other celebrations and host flower arranging classes and pop-up flower bars where guests can build their own bouquets. 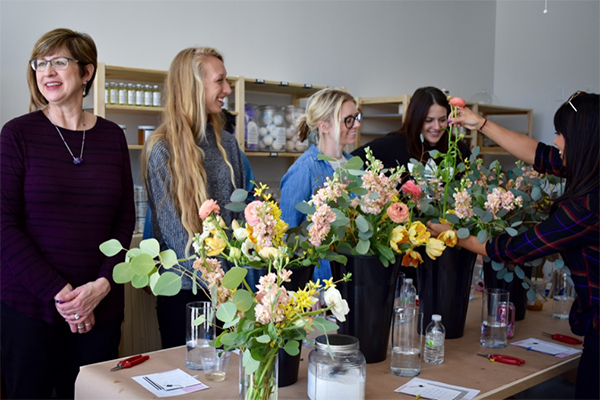 We want to make floral design fun and accessible to everyone or, as we like to say, offer “florals for all.” There are hundreds of talented florists in the Detroit area, but LPF does things differently: We allow people to explore their creativity in a new and unique way while learning a thing or two about flowers. 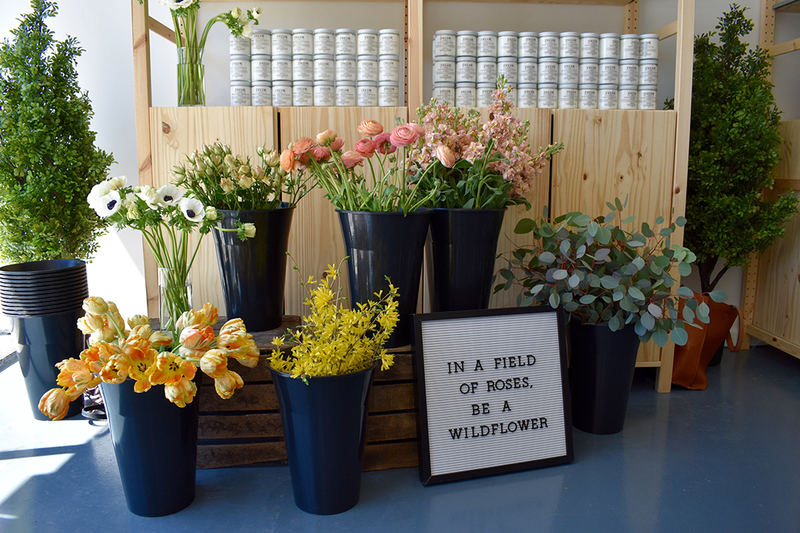 At an LPF event, you’ll experience the feeling of being at a French flower market with fragrant, colorful blooms in buckets ready to be picked, flowers wrapped in kraft paper and perfectly tied with twine, and our signature black-and-white striped card tucked neatly inside. It’s a carefully curated experience meant to replicate the same scene my sister and I fell in love with while traveling together in Paris. 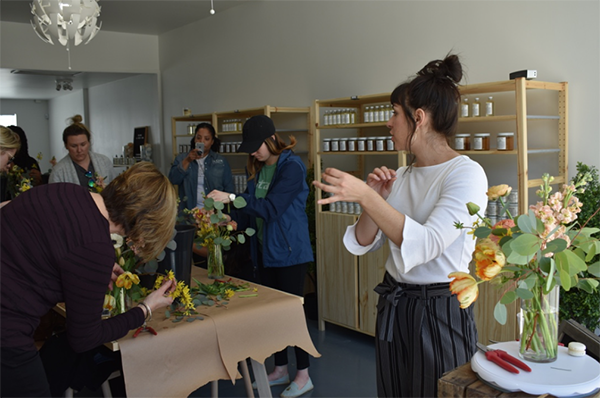 Liz’s sister, Jenna, leading a flower arranging class at Cream Blends in Royal Oak. Flower arranging can be fun and easy. Here are some of my favorite tips for experimenting with flowers to add some freshness to your space. Many people believe that fresh flowers are an expensive treat that can only be enjoyed occasionally. Not true! In spring and summer, many of the beautiful flowers we see in bouquets are available all around us in Michigan. Grab a pair of snips and wander around your local park to gather lilacs, lilies, dogwood and more for free. For flowers with very woody, branch-like stems such as lilacs, hydrangeas and eucalyptus, your scissors or floral snips may not cut it — literally. To bust through the thick branches and ensure that your thirsty flowers get enough water, take a hammer to them. Smash the ends until they splinter and fray, so they can take a big drink. A lot of bouquets come with long-stem flowers. Don’t feel like you need to keep them long. I believe flowers look most interesting when you cut stems to different heights, so your eyes move around the arrangement. Play with shorter vases, too, but avoid wide vessels to keep stems from splaying. For a fresh take on flower arranging, instead of putting all your flowers in one vase, spread them out between a cluster of smaller bud vases that hold two or three stems each. Group three or five vases (odd numbers always feel more balanced) that vary in height and shape but share a similar style to create an interesting collection. Garage sales and The Salvation Army are my favorite places to look for unique, affordable vases. 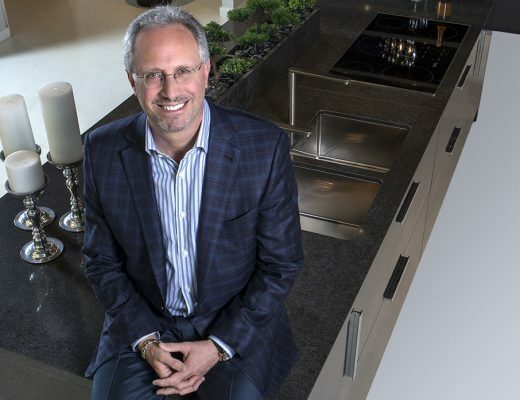 Most people know to cut flower stems on a 45-degree angle right before putting them in the water, which provides more surface area for drinking. But flowers only want to drink clean water. Fully replace the water every day or every other day and scrub your vase clean to remove bacteria on the walls that can make your flowers wilt faster. Contrary to popular belief, you should not place your cut flowers in a sunny area. Once flowers are cut, sadly, they’re already dying. At this point, you want to preserve them as long as possible, which means keeping them in a cool area away from windows and air vents that can dry them out even more. LPF is owned by Liz Smith Mally, a Metro Detroit-based entrepreneur with a passion for all things creative. Combining her love of nature and bringing people together, Liz started LPF to add a little beauty to the everyday. 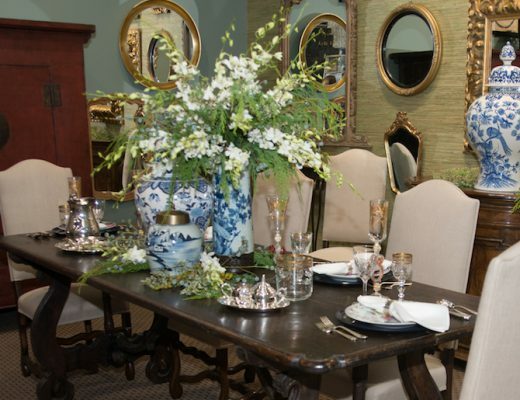 LPF is a one-of-a-kind boutique studio with a focus on florals. From weddings and special occasions to ordinary days, LPF believes everyone deserves the simple pleasure of gorgeous fresh flowers. Visit lpfblooms.com for more information, or follow LPF on Instagram at @LPFblooms and Facebook @LPFdetroit.